One of the most wanted ad appreciable application for Android Mobile Phone is Maps Application. Various Maps provide features which provides different comfort zone. Here are the top 9 Android Apps (Maps) with their unique features. Hence you can choose one of the best feature which can be compatible with you and your Mobile Phone. This GPS includes includes Aerial photography, survey explorer Maps, topographic Maps, Open street Maps, outdoors Maps and ATV trail Maps. It provides detailed information about the location you require and is easy to use. You have an option turning the GPS on and off automatically. This GPS is useful for hiking, hunting, kayaking, snowshoeing & backpacker trails. This Android Apps is an handbook which has detailed information about subway, buses, trains and all over the world describing it to you in the format of Maps. It shows the maps of around 180 cities and allows you to store the maps in SD cards or USB storage for later use. But it doesn’t provide options like alternative route or shortest path. This Mobile Apps get self started after the booting of the mobile, hence it consumes a lot of mobile charge. It supports Multilanguage interface, Knows its bugs and works accordingly and also update Maps automatically. This is the best Mobile Apps for people who love roaming and doesn’t stay long at a Particular place. Maps (+)/Maps (-) allows you to use Maps even when you are not under Network Connection. Maps (+) provides you off-grid Navigation, it can be termed as an idle usage for international roaming. It can also autoload the previous Map through which you exited last time. The drawback is at-times it gives approximate results and consumes lot of Mobile Charge. 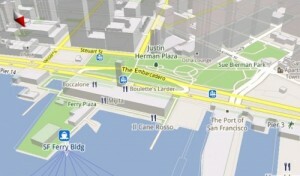 Maps (-) is also an Offline Map which support Ads version. Some of the main features of this Map is magnification of Maps for comfortable readability, Map sources, GPX files, recursive caching and GPS with auto-follow capabilities. This Map is best for hunting locations and retrieving data from the Maps. With just one click you can update the GIS data. There is also an intelligent form-based data entry driven by ArcGIS data models. You can attach photos and videos. The search takes place through keywords. Once a keyword is given the Map will result in the relevant data Map. You can mark your frequently used Maps and details as favorite and the access to that link will become faster. This is one of the best free voice Map Apps available in the market. It’s worth spending time on installing this, because the level of comfortably is beyond expectations. You can give your location as input and then your Phone will direct you through voice, you can keep following the instruction. It has recorrecting capabilities of the route. You can also perform various other activities while using this App. RMaps are nothing but Navigation tools which has two modes, Offline and Online. Online Maps can be used to fetch maps based on the location required by you. Offline Maps Viewer can be used to draw your own Maps on PC which can be stored and used for later use. It is one of the simplest Map and features of this Map are as follows – auto rotate (Maps) in driving directions, provides auto-follow functionality, auto-rotate in northern direction. This Gaia GPS is known for its backcountry, off-grid, and off-trail adventures. It is an offline Map hence the connection doesn’t require to stay long time. It provides information along with coordinates, sunrise or sunset, pace and moving time. You can download Maps when you don’t have any network connection, you will have to pay just once and then utilize the service as many times as you want. This Map is best for travelers, once installed you can get instant Maps of the place you visit. You can use this Map in offline mode also. This App is lightening-fast, the information passed using this Mobile Apps is always up-to-date. It can display the state of WiFi and allows USB storage/SDcards. MyDirection is an extension of Google Maps, it is an improvised version of all other Google Maps, but G maps instead as a base layer. You can operate this Mobile Tools with just few clicks. You can also create multiple list of custom destination, like you can decide on the favorite destination (for example your favorite place). One of the unique feature is it has Restore capabilities from backed-up data currently not available.